Yes, we’re taking a line from the upcoming PBS series in today’s missive. But the announcement in the wee hours of the morning (local time) that a trio of women campaigning for peace in Africa and the Arab world had won the 2011 Nobel Peace Prize made us think that this is a good topic for today. Ellen Johnson Sirleaf of Africa is Libera’s first elected female president (a feat we have yet to accomplish in the United States) and her choice is controversial. She’s a leader who is in the midst of a heated election campaign in her home country and who is much more admired abroad than in Liberia. Her fellow countrywoman, Leymeh GBowee, is the head of the Women for Peace movement, and was lauded for reaching across religious boundaries to unite Muslim and Christian women against the warlords who dominate Liberia. The third woman, Tawakul Karman of Yemen, is a pro-democracy demonstrator who was instrumental in the events of the Arab Spring. So why should a blog about World War II veterans concern itself with peace prizes? Because these women, like the women we’ve talked to about their World War II experiences, were agitating for change. 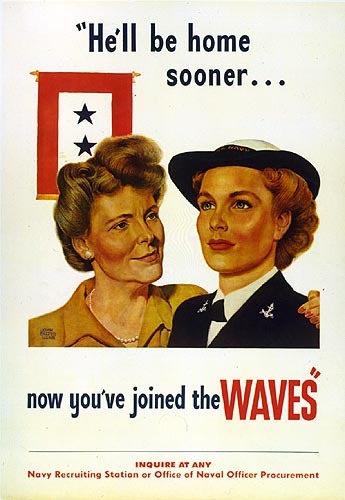 Some saw their wartime roles as a temporary sacrifice which would ultimately result in a shorter war, others saw joining the military as a way to prove that women could to the same work men did (and get paid the same). Congratulations to this year’s Nobel Prize winners.